Monitor locations of loved ones and valuables without overdoing it with the Amcrest AM-GL300 V3 Portable Mini Real-Time GPS Tracker. Stay on guard with the people and objects within particular zones you wish to observe. Keep an eye on yourself, your loved ones and even assets with the help of this Amcrest GPS Tracker. This tracker enables you to track anyone and anything, anytime and anywhere. You can specify zones you would like to monitor or evade with the help of the geo-fencing attribute. The said geo-fencing attribute also allows users to establish different types of zones to further elaborate desired boundaries. Users can also establish max speed of a vehicle to be monitored, its proximity to an area and more to suit preferences. Once these things have been established by the user, the GPS triggers an alarm when it gets it those zones or in that speed. When used in vehicles, this GPS tracker can still work even with boats. It can also work the other way around. Once the monitored person or object goes outside your established zone, an alarm can also be set off. The recorded locations, movements, and other details are sent to your registered email and are easily accessible. These reports can be retrieved from one’s PC, Mac or smartphone (given that it has an installed Amcrest GPS App). Another supplementing feature of this tracker is its intuitive UI, which allows users to monitor and manage activities and customize settings. Aside from email notifications, users can also receive text notifications once an alarm set off in your GPS tracker. Sharing zones through links are one unique feature of this GPS tracker. Share links with your loved ones to keep track of them. This can also be done to track one another, not just one person monitoring all at once. It is also possible through this feature that many users get to monitor a single object or vehicle. As for its battery life and durability, the Amcrest AM-GL300 V3 GPS Tracker has a good quality to offer. Once in full charge, you can already enjoy it functions for 10-14 days, depending on the frequency of use and workload. The device also comes with a waterproof feature, allowing you to use it even extreme types of environment. This is made possible through a compatible IP67 Heavy-Duty Weather Magnetic Casing, which needs to be bought separately. Not only can it protect your device from water, but also from mud, wind, and dust. This tracker comes in size so petite—almost the size of a cigarette lighter— you could bring it anytime, anywhere. It has a customizable boundary and fencing setting, allowing personalized monitoring and guarding. You can do different monitoring purposes with this tracking device. It has a sharing feature to enable shared monitoring or multiple monitoring of different objects or people. It gives retrievable data of the movements, locations and other details to the user’s contact set, allowing full monitoring and observation of the person or object. It can be used for a long time given its battery life and can be used in any circumstance given its size and weight. Offers protection for maximized functioning and long-lasting service. The Amcrest AM-GL300 V3 tends to have its first-time use jitters. There have been reports stating that customers had a tough time activating the device and its passcode. The passcode failed to connect to a network, and the device had to undergo multiple restarts before working. Protection of this device from weather and environmental conditions come in a separate package. Users would have to buy the indicated leather case to have the apparatus protected from harm caused by the environment. Taking into consideration the product itself, it already has everything a GPS should have, even coming with an additional feature—which is link sharing. This alone already gives excellent value to your money. It allows you to do many ways of monitoring and fencing without much worry. The way it notifies and gives users alerts on movement and location is also very budget-friendly. No materials are wasted, and no money is spent since the notifications come to your email and mobile phones. Protection features should also not be ignored when buying devices such as this one—a device that will, quite often, be exposed to nature’s harshness. The fact that the protective case of the device needs to be sold separately is a downside but not so much of it. What matters is that it has the option of protecting the apparatus from such harmful elements. 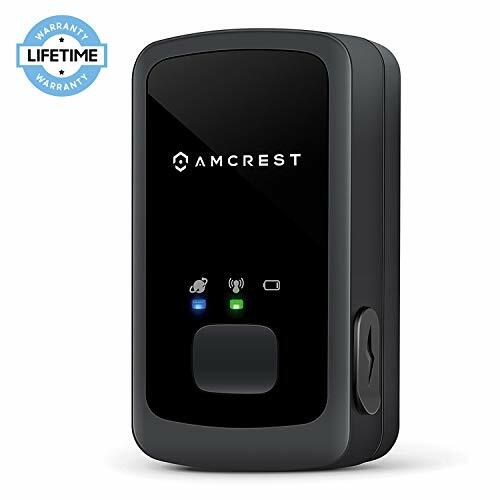 The Amcrest AM-GL300 GPS tracker is highly-recommendable for everyone who needs to keep an eye on people or things. It does not matter whether they are new users of GPS trackers or not. This one will be extremely beneficial for them, given its simplicity and customizability. Given that it also enables multiple tracking, this will work well for families and companies for wide-spread monitoring. People wanting secured and accurate monitoring will find this product beneficial. The history reports are also handy features of this product for any cases of asset loss. Users can track them throughout and not have worries on losing those records since they can use it as a reference of the locations and activities of the lost object—or even person lost. This feature also ensures confidentiality of the details among the user or group of users having authority over the person or item. Regarding its features and capacities, the Amcrest AM-GL300 GPS tracker is an excellent tracker available. From the way it can monitor the number of observers it can share with, to the protection and informing manner it has—this one has it covered brilliantly for its users. Despite the downsides of this tracker, you can still work your way out of it through seeking professional help. The stress-free management and carrying of this tracker is also another factor that makes the Amcrest AM-GL300W one unique GPS tracker among others.